About Us - DeliveryMaps.com - America's Leading Source of Delivery Maps! DeliveryMaps.com is America's leading source of delivery maps for several very important reasons. 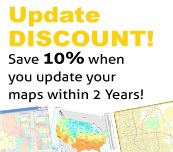 Our maps contain the most up-to-date information available AND are high quality products at a reasonable price. We have pioneered the production of maps for more than 28 years. Businesses in every state use our maps. They cover every region, state, metro area, city, community and address in the USA, and can be customized to cover the precise area you need. At DeliveryMaps, you get exactly the maps you need ... and FAST! We develop our own software and databases, seamlessly covering the USA, right down to the street address. We are the first to print every map in a selection of sizes, up to 12x16 feet. And we offer digital maps, perfect for viewing on your PC, driver maps and map books. Please call us if there is any way in which we can serve you and your business.